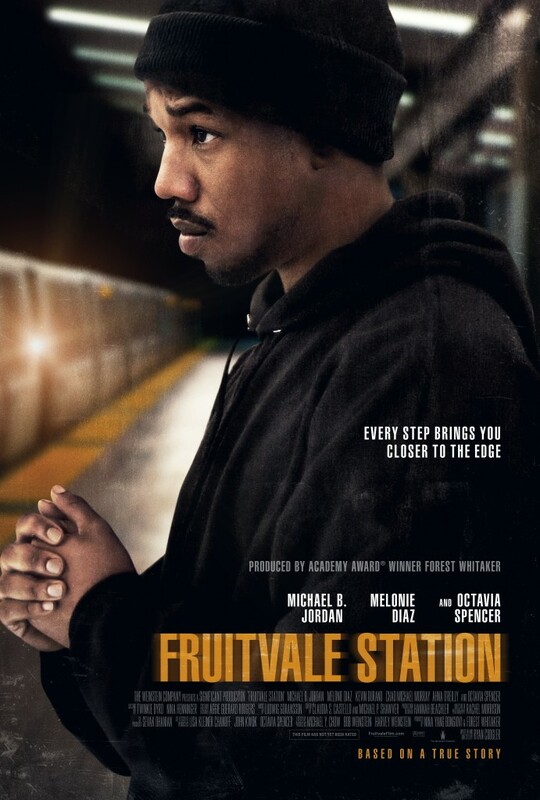 There’s a scene late in Fruitvale Station that is about as astute and subtle a depiction of the disparities between white men and black men in America as I’ve ever seen in a major motion picture. Oscar (played magnificently by the phenomenally talented Michael B. Jordan) is standing outside a store waiting for his girlfriend, Sophina (beautifully portrayed by Melonie Diaz), and her friend to come out of the bathroom. He had just sufficiently charmed the owner into letting the two women go in when a white couple appears. The wife is pregnant and needs to use the bathroom too. The owner lets her in as well, begrudgingly, leaving Oscar standing outside with the husband. The two have a casual conversation that serves three purposes: one, to let the audience know that Oscar has been seriously considering asking Sophina to marry him; two, to remind us again how charming and at ease Oscar is with all kinds of people (remember – he also charmed the young white woman who didn’t know what fish to fry), and three – and most notably – to underline just how much harder it is for black people, black men in particular, to get their lives together than it is for white folks. And yet, this is what the film really leaves us with, what it’s really about: A young brother who is just trying to get it together. We have spent the bulk of the movie watching Oscar fumble about trying to sort out his life. We watch him trying, by turns, begging and threatening, to get his job at a grocery store back. We watch him contemplate going back to dealing drugs. We watch him argue and seduce Sophina, charm and spoil his mother for her birthday, bail his sister out of her own money troubles, and perhaps most poignantly, dote on the one thing in his life that makes total and complete sense to him – his daughter. The struggle is real, specific. We care. After a trying day, Oscar then gets to listen to this white man talk so casually about marrying his wife when they had “nothing” and then starting a business that is apparently doing well enough that he hands Oscar a card. Jordan’s reaction – a remarkable combination of respect, admiration and, just a touch of jealousy – says all we need to know. For this white man, things come so easily. In Jordan’s performance in that moment, we are reminded again that it’s just not as easy for a brothers like Oscar to get their lives together. I couldn’t watch the George Zimmerman trial for the murder of Trayvon Martin for more than 10 minutes at a time. The pain was too acute. The trial was such a mockery of everything that we are told to believe the “justice” system is supposed to be. I couldn’t bear to listen to the “balanced” coverage discuss how it’s about race and also not about race. To see exactly how the system is rigged was simply too much. And yet, there was a split second last night right between the time the judge asked the jury if they had a verdict and the moment that the verdict was read that I thought that George Zimmerman would be convicted of murdering Trayvon Martin.